If you have any questions about the SEA RACER information page below please contact us. The motor yacht SEA RACER is a 47 metre 153 (foot) generous aluminium boat which was produced by The Feadship De Vries Shipyard and her design plans were devised by De Voogt Naval Architects. Accommodating 10 guests and 10 qualified crew, motor yacht SEA RACER was named Detroit Eagle. This graceful boat has been envisaged by the naval architecture of De Voogt Naval Architects. John Munford was successful with the designing of the interior. De Voogt Naval Architects was the naval architecture company involved in the professional superyacht composition for SEA RACER. Her interior design was completed by John Munford. De Voogt Naval Architects is also associated with the yacht wider design collaboration for this boat. Created at The Feadship De Vries Shipyard the yacht was built in the known yacht building country the Netherlands. She was officially launched in Aalsmeer in 2001 before being handed over to the owner. A fairly large area is manifested with a total beam (width) of 9.21 m or 30.2 feet. With a 1.86m (6.1ft) draught (maximum depth) she is fairly shallow. The material aluminium was used in the building of the hull of the motor yacht. Her superstructure over the hull is fashioned with the use of aluminiumandgrp. In 2007 extra refitting and updating was also performed. Powered by three MTU / HONEYWELL-VERICOR codog engines, SEA RACER can attain a maximum speed of 34 knots. SEA RACER is propelled by twin screw propellers / 1wj (kamewa s series). She also has an efficient range of 3000 miles when motoring at her cruising speed of 22 knots. Her total HP is 12900 HP and her total Kilowatts are 9492. With respect to bow thrusters she utilises Holland Roer. The ample luxury yacht motor yacht SEA RACER is able to accommodate up to 10 guests and has 10 qualified crew. 46.63 metres / 153 feet. 16V 4000 M90 / TF-50 codog. Cruising at a speed of 22 nautical miles per hour. Range in nautical Miles is 3000 at a speed of 11 knots. Ddc 2 times 100 kilowatts. 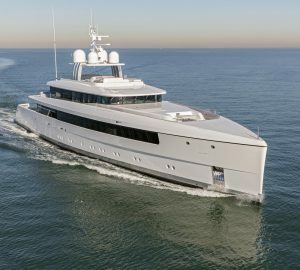 The yacht uses Heinen & Hopman air conditioning system. Her deck material is predominantly a teak deck. The luxury yacht SEA RACER displayed on this page is merely informational and she is not necessarily available for yacht charter or for sale, nor is she represented or marketed in anyway by CharterWorld. This web page and the superyacht information contained herein is not contractual. All yacht specifications and informations are displayed in good faith but CharterWorld does not warrant or assume any legal liability or responsibility for the current accuracy, completeness, validity, or usefulness of any superyacht information and/or images displayed. All boat information is subject to change without prior notice and may not be current.